Christmas markets are one of the best things to do at this time of year. The sweet-smelling aroma of those Christmas biscuits and beautifully baked local foods will make your tummy rumble just in time for Christmas dinner. All last minute shopping is within reach and the children will be amazed by the twinkling lights and decorations that are spread throughout the place. We are going to take a look at some of the best upcoming Irish Christmas markets that are on offer this year. There’s options from Belfast to Dublin and all in between so don’t miss out on this years’ festive cheer. All of George’s dock will be transformed into the ultimate Christmas market this Winter, complete with a giant custom built ski lodge. There will be exciting activities for all, with street food and DJ’s too. There will also be some family fun including Santa’s grotto, carousel rides and tasty snacks. Other interesting things to try out are the ski themed games, selections of special festive drinks, ski photo booths, snow machines and fancy dress. Having started on the 30th of November it’s running until the 23rd of December. So make sure you grab your tickets now and get in on the festive fun. Running until Friday the 22nd of November this market is perfect for all those who are living out in the West. With a variety of entertainment and stalls, you won’t want to miss out on this one. Featuring amusement rides with a 32 metre high big wheel. Not forgetting about the kids, there there will be a carousel, puppet shows, storytelling, school choirs, carol singing and Santa’s grotto. For all the food lovers, there will be a wide selection of tasty treats such as crêpes, waffles, pretzels and more. Pop on over during the week from 12pm-8pm and on the weekends from 10am to 10pm. Another must see Christmas market from Munster can be found right in the heart of Limerick City centre. The Milk Market has been in operation since 1852 and prides itself on providing visitors with access to a wide variety of fresh, local, in-season products, typically directly from the producer. This years Christmas market will include themed stalls, competitions, choirs, games, food and of course Santa too. Open until the 24th of December, the Milk Market will have all the best seasonal food and produce at the market. With great entertainment also on show, you definitely won’t miss out on the Christmas cheer in Limerick city. There is a wide range of things to do at Christmas in Cork with the GLOW Christmas market. 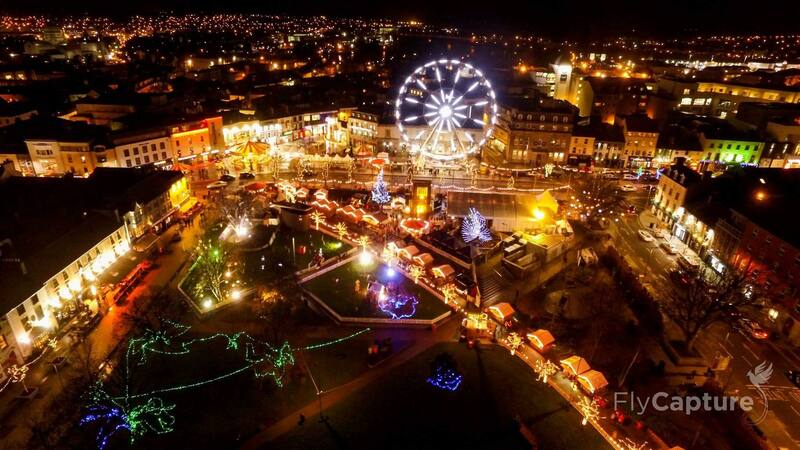 Visit their free festive installation in Bishop Lucey Park to soar high above Cork on a giant Ferris wheel or indulge in all the mouth-watering festive food. There will be entertainment in every direction and something for all the family to enjoy. Taking place every weekend from the 1st to the 22nd of December, the markets open from 12pm until 8:30pm and the Park opens from 4:30pm until 8:30pm. So don’t miss out on this festive fun if you are in Cork. 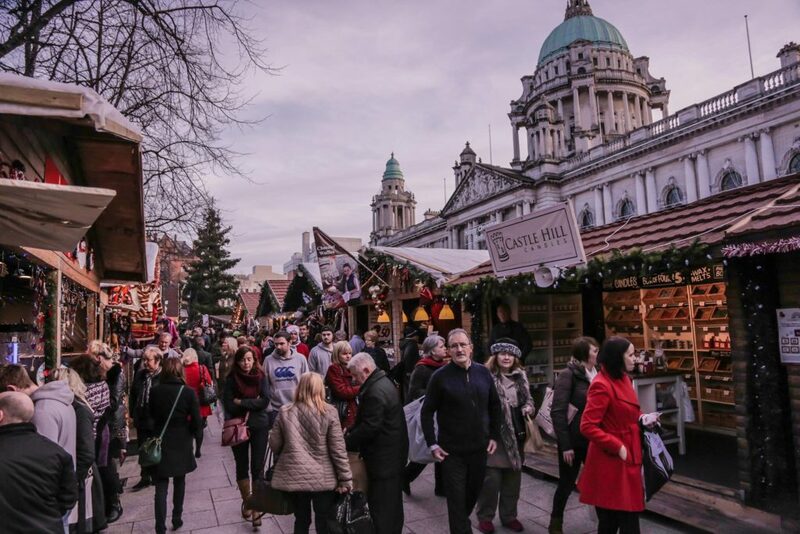 The Belfast Continental Christmas Market offers a real welcome to everyone who heads up north this Christmas. Thanks to the culinary delights and bustling stalls it has to offer there is plenty to see and do right up until December 23rd. With a huge range of continental treats on offer from churros to kangaroo burgers, you will definitely have a new taste experience. On the grounds of Belfast City Hall, this attraction will be hard to miss as almost 1.3 million visitors attended last year. Head on over to get the most of the festive cheer. This immensely popular Christmas market is located in Hangar 1 at Sligo’s Airport from December 1st to December 22nd. Artisan food and craft producers from all over the west will be coming to this village for the seven festive markets throughout the month. Santa will also make an appearance in the terminal building throughout the month. All the funds raised from Santa’s grotto will go towards the great cause of building an all-inclusive centre for children and young adults with special needs. 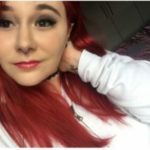 All of this has been made possible by the great work of the Our Voice Their Future Northwest charity. When shopping here every 10 euro you spend will mean that 24 euro goes towards the local community in Sligo. SSo don’t be shy and head on over as soon as you get the chance. Now that you have heard of all the Christmas markets happening throughout the country, don’t wait any longer. Get everyone in the car and head on out. Take a ride on a Ferris wheel and see a beautiful town twinkling in the night, buy some eggnog and don’t forget to visit Santa’s Grotto.